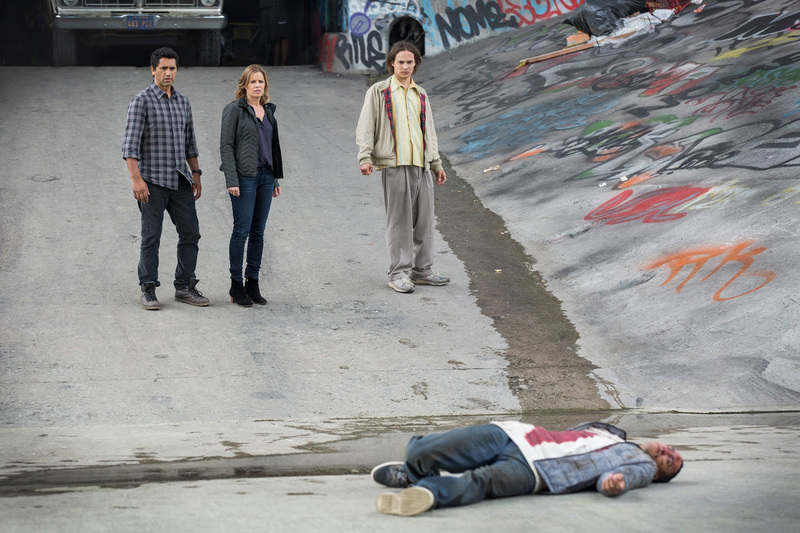 (l-r) Cliff Curtis, Kim Dickens and Frank Dillane in FEAR THE WALKING DEAD. ©AMC Network. HOLLYWOOD—It can be both a blessing and a challenge to star in a spinoff of a wildly popular TV show. On the one hand, you have a built-in audience who already is familiar with the set up. On the other, inevitably viewers will judge and compare your version with the original. 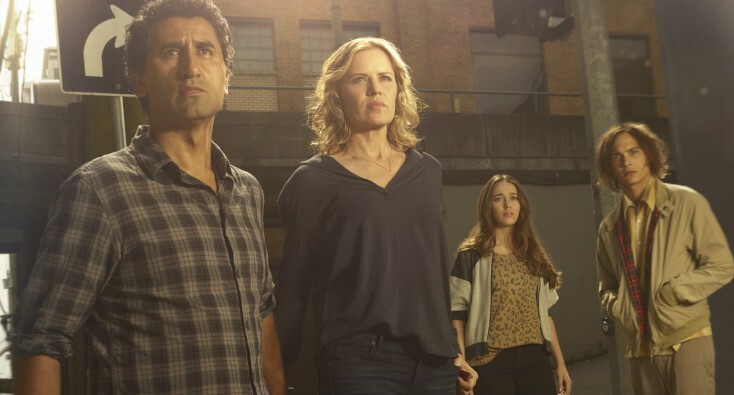 Thus is the case with “Fear the Walking Dead,” the highly anticipated spinoff of AMC’s “The Walking Dead.” The fantasy action series stars Cliff Curtis (“Star Trek,” “Pacific Rim”) and Kim Dickens (“Deadwood,” “Treme”) along with a ensemble of other actors depicting everyday people whose lives are upended by a deadly outbreak that turns people into zombies. Unlike the original series, which is set in the mostly rural Southeast U.S., “Fear,” created by Dave Erickson and Robert Kirkman, is set in urban Los Angeles, and earlier than the original series began. In the pilot episode, airing Sunday, Aug. 23 9 p.m./8C on AMC, the main characters are introduced and there are only hints of the virus spattered throughout the show. Curtis and Dickens play live-ins who work at the same high school. He’s an English teacher and she’s a guidance counselor. Initially, Travis and Madison simply face everyday challenges: parenting their own kids (from previous relationships), work crises, dealing with exes and rebellious children. Those difficulties are sure to become less important over time compared to what the audience knows what’s coming. Both veteran performers, Curtis and Dickens recently spoke about the series, being part of the “Walking Dead” phenomenon and more. Q: Did you have any second thoughts about going into a series that comes from a hit of AMC’s or did you simply decide to just go for it? Curtis: I read the script. My primary concern is the quality of the work and the team that I am working with. Then I looked at the script and I thought, well that’s a good start. It’s a good script. I went through the casting process and I met the director and the producer and the mechanics of what we do, the day-to-day of what we do is a lot of work. That’s kind of where all of our energy goes for us primarily. But there was a lot of excitement about doing the pilot for such a successful franchise. That’s been a wonderful boost and privilege to know that we have got this very definite audience that at least is curious about what we are doing. It’s a great pleasure to have the support of a very successful team. Q: When you met with the actors from the original “The Walking Dead” at Comic-Con, did you get a chance to talk shop? Dickens: They just came over to us and just embraced us right away. They were so kindhearted and so generous of spirit. They just were really excited for us and were sort of cheering us on, encouraging us. Q: Did they have any advice? Curtis: No. They were just being really supportive. Dickens: They were so genuinely excited for us. That’s just a reflection of their experience, which has been probably some of the hardest work they have ever done. They are in a grueling environment and it seems like they love it and find it so rewarding to be a part of that show. Curtis: But no trade tricks or how to deal with the zombie apocalypse. Q: I was wondering more about how you deal with all the hysteria of fans? Dickens: They appreciate them. It was all sort of positive and affectionate. Curtis: It’s funny. When we met some of the fans of the original show, they were so nice. They could have been like, “Oh, who are these people? What are they?” But they were very sweet people in there. We met whole families: mothers, husband, wife, children, and they had like little zombie dolls. (He laughs.) It was so cute. That was quite surprising to me. Dickens: It’s a family show. Q: The fact that this series is not based on a comic book (as the original is), is it a good thing or a bad thing? After all, anything can happen, right? Dickens: There is nothing bad about it. By not having the comic book, you don’t have that bible to lean on and to research and flip through all the time for ideas. But at the same time, you have a lot of freedom to go anywhere. I thought it would be fun to have a comic book happen later. Curtis: Ruben Blades is in the show as Salazar. He is an avid comic collector. When he got the show, he read the entire other comic’s series. He’s very devoted to it and takes it very seriously. Q: Curtis, back home in New Zealand, is “The Walking Dead” as big as it is elsewhere? Curtis: I think so. I had people screaming at me that I knew for many years, but I didn’t know that they were in that whole world. When I told them, it was like there is thing, they started talking about the mythology I was doing this show, they were like, “It’s a metaphor for life!” And I was like, “Oh, where did this come from?” It’s obviously something that they’re really passionate about. In New Zealand where everybody is usually so laid back. They must have sort of nurtured this thing and then suddenly just had this huge outpouring. Q: What would you say are the similarities and the differences between this show and the original? Dickens: It’s the same mythology and the same rules and the same laws and the same creator’s vision. The differences, we are in a completely different location and completely different kind of environment. Not rural, but quite urban and quite diverse in Los Angeles. And timing-wise, we are pre-apocalyptic. We start with a family in normal day-to-day existence and we watch things slowly start to crumble in society before their eyes. Those are the differences. Q: Do you feel that you personally are ready for some natural disaster or epidemic? Dickens: I think doing the show has sort of been humbling in that confidence area because I have earthquake stuff at home that I bought at the Army/Navy surplus store, but I am pretty sure it’s expired now. My food and stuff has expired. I even have the backpacks that I put in both the cars. I would think about in our show, I would think about that moment between that first earthquake jolt and that moment right after, like we have a lot of those moments in the show. Like what’s next? What’s going to happen? That moment that freezes you, makes you think so fast, and how instantly life can become so dangerous. We take it for granted but all we have is this moment. Q: Are you surprised there are almost no zombies in the pilot episode? Dickens: I don’t even really think about that, because I think about us navigating our way through this crisis. Curtis: When I read the script, I was. I was like, “Oh, wow,” because this was actually about people. All of them did feel like real people, the people that I can relate to. They are not action heroes. They are not cops or government officials, army people or scientists. They are like high school teachers, counselors. They’re a divorcee and a widow. I can really relate to these people and I was surprised by how relatable the characters were. In this show, for a while at least, the threat of the zombie apocalypse is not apparent. Something weird is happening that we don’t understand and we spend the good number of episodes trying to understand. There is a lot of confusion. Dickens: Traffic is going to be bad. Q: Do you feel like there is a lot of pressure for this show to do well? Dickens: No. I think we were super-excited to be a part of the anthology or the franchise, as you said. But I don’t assume anything. I think I just luckily forget about any of that pressure. All of the questions bring it up. But I think as an actor, you usually just put your head down and do the best work you can do and then in the end you hope that the audience responds to it and that it finds its audience. That’s all you can hope for, that it resonates with people and makes them feel a part of something they like going back to every week. But we have no assumption that we are going to have that. Curtis: This is what is curious about the first script. I wanted to read it. Is the script going to kind of take the original concept and put it on steroids to sort of up the fix for that audience? But they didn’t. They said, no, I am going to go over here, and I am going to start from scratch. I am going to build our way through this whole thing from the beginning. That’s refreshing. It’s kind of interesting because in other show, if the audience needs it bigger, they can do that on that show. They can go in the next episode, kill more zombies and have bigger weapons and be more, super action-y. I suppose it’s a big ask for that audience who wants that in our show, is to ask them to come and start with us from the beginning and to get to know who we are and to accept the slow burn for few episodes. But I feel really confident that in each episode, the tension builds and builds and builds and by the end of the first season, they will get a fix. Q: You’ve already been renewed for a second season. Does that make you more confident right? Dickens: Sure. That means they will invest in us and give us a shot. Q: Were you familiar with the original series before you got the role? Dickens: Nope. I had seen a few and then I was advised not to for my character. I wouldn’t know what that looks like and I didn’t want to sort of get it in my head anything. I had to sort of try to remove and go on a moment-to-moment basis so I just feel naïve about it, about the apocalypse. It serves my character, but I am sure I will binge on it at some point. We love the actors that play. Q: As the lead characters, are you kind of secure in your job or do you feel threatened by the kind of show that kills off characters? Curtis: Everyone is up. “Game of Thrones” set that bar when the king was taken out in the first season. Everybody has the potential to go and I think that’s good for the show and good for us. Take nothing for granted, and you don’t. Dickens: Just like real life. We are just playing real characters.